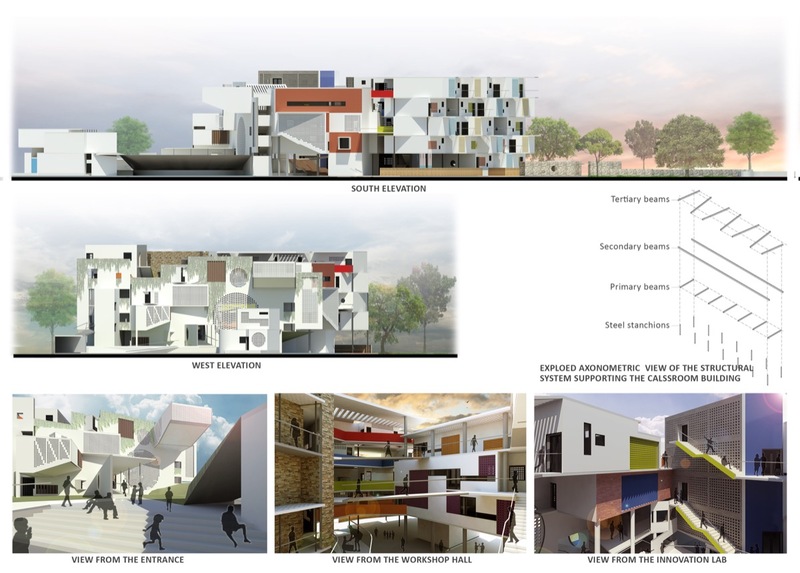 B.Arch Thesis by Akshay Mirajkar | Rachana Sansad Academy of Architecture. In the recent times, the field of education has witnessed numerous variations on a large scale. Due to the rising commercial aspect, schools are becoming grander in terms of garnering the image of being the best one in its field. In order to sustain in this competition, schools tend to market themselves through various lucrative offers, thereby rendering the students as mere consumers of a product. Over the years, School marketing, in India and across the world, has become a booming industry, and is set to grow even further as the focus of schools is on building sustainable brands. Research shows that marketing spends are on the rise in response to the increased competition for students, staff, and resources. The aim is to attract and increase the quality of students every year, retain top faculty, increase student placement opportunities through continuous interaction with businesses, optimize cost of achievement per candidate. Also, in this scenario, misleading architectural imagery plays a significant role where it becomes the platform to attract the consumers. Due to this rat race, quality of education suffers the most as the schools are evolving with providing various infrastructural facilities, but the quality of space required for learning has remained constant or is left unexplored. Firstly, through documentation of two city schools; the thesis studies the existing schooling scenario. Thus, after drawing conclusions from the above study, the thesis tries to answer the needs of the city through a design project. The LFS has an oval shaped layout with a single loaded corridor connecting all the programs having service cores at each ends. Due to the large scale volume of the atrium, the noise coming from children playing in the central space causes a nuisance to the classrooms on the ground as well as the floors above. Also, the hotel like lobby space (without any windows opening on to the corridor) and the standardised composition of the programs hampers the curiosity amongst the students. The layout of BCS consists of a long and narrow corridor which connects the classrooms in the middle and resource centres and staff space at each ends, having two service cores for the working staff and the students. The scale of the lobby causes a nuisance to the classrooms due to the noise coming from children walking or playing in the lobby and also creates a sense of suffocation, as the only opening is at the end of corridor. The hotel like lobby space and the standardised cell like composition of the programs hamper the curiosity amongst the students. On comparing the classrooms, the scale as well treatment of the interiors of them for different user age group remains the same throughout. After studying the existing situation, it is clear that there are various schools in the city imparting education through diverse approaches, with each having its own scale of conduct. Theoretically speaking, the learning environment required for each of them should be different, based on their principles of functioning. But in practice, a standardise plan of a double or single loaded corridor with classrooms and other program spaces on either sides becomes the common ground when it comes to formulating a dedicated space for the same. Looking at the documentation of the city based schools; the most striking flaw, which requires serious attention, would be the failure to address the curiosity of the child at any given age. Children at any age, have a tendency to know about what their schoolmates are learning, irrespective of the age group. With a walled – fortress like classroom, this desire of the child often gets unanswered. Another major area of concern is the ignorance towards the scale of spaces. In order to maximise the space and avoid any complicated structural arrangement, the scale of the classrooms as well as other program spaces remain the same throughout all the age groups. Due to this, there is a sense of reluctance amongst the students to familiarize with the school space. Finally, the quality of space, which differs from each institution, requires instant consideration. The learning environment required for each age group is different and depends on their psychological growth at each stage. Use of repetitive and uninteresting as well as over stimulating visuals of spaces may create a hurdle in learning by altering their thought processes. Hence, a significant amount of energy should be spent on to create a visually inspiring learning environment with equilibrium maintained between the dull as well as over doing of spaces. The site is located in a humble neighbourhood of Chinchpokli along the lalbaug flyover, which is at a 10 min. walking distance from Chinchpokli railway station. The school is surrounded by a variety of programs i.e. residential, commercial, and industrial, etc. Topographically, the site sits on a flat ground with a large open space on the rear side of the school plot. The school building is G+ 4 structures consisting of classrooms along the road side while offices, pre-school classrooms and a multipurpose hall is on the rear side of the school plot. The aim is to design an institution which promotes education with an holistic approach of learning which focuses on – finding child’s true identity, meaning and purpose of his life. The above can be achieved through connections to community, to natural world and spiritual values. Hence, such a project requires a strong neighbourhood where cross exchange of knowledge takes place between the students and the community, thus educating both of them. With this project, apart from learning, the intervention would serve as a core to restore harmony within its people. The site at chinchpokli is up for redevelopment, in order to upgrade and modernize the current situation. The planned project is a school tower at the present site which will accommodate all the requirements. And thus, can be a blunder of the past mistakes. 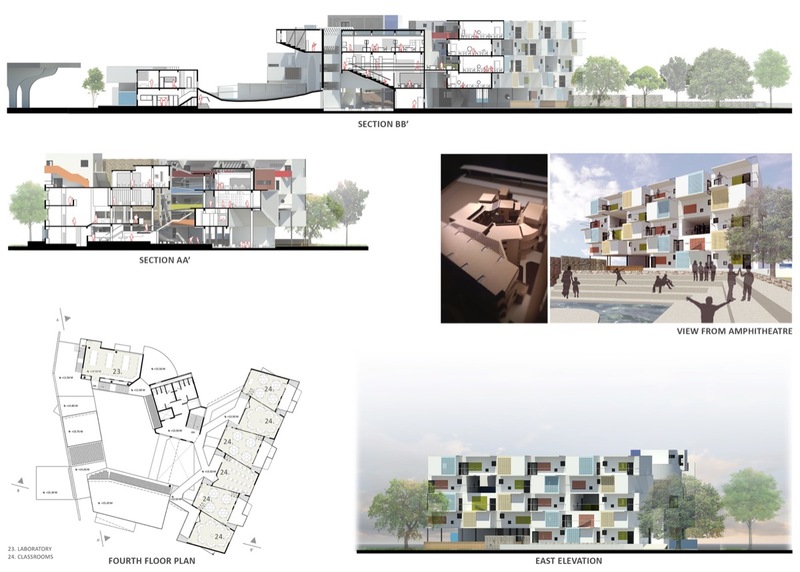 Hence, to avoid the above scenario, the designed project will thus serve as a proposal to the redevelopment project and also, to the city as an example of a school with an out of the box approach of learning which takes cues from its own people and nature when it comes to facilitate education in a dense neighbourhood. On closely studying the movement patterns, it is clear that majority of the students, learning in this institution reside in the close proximity of the institute. Currently, the institute does not provide any seating or waiting area for the parents who have come to drop of their children. Due to this, they are forced to wait at the school gate causing traffic jam and inconvenience to other residents. The part of the School building which faces the main road has been rented out for commercial activities like Doctor’s clinic, private office spaces, government post office, etc. Also, there is a line of shops thronging along the northern edge of the school plot, which is backed by an old deserted warehouse. There is a public recreational ground on the rear side of the school plot, but it does not have any official access to it. A tertiary road leads up to the open space, but it is blocked by a temple and a private office. The main aim of the project was to design a knowledge hub, thereby enhancing the learning process, emotionally as well as physically. The program to be derived should be based on the holistic learning of the students i.e. not binding within the four walls of the school. Hence, Special programs like a community centre is included which would encourage cross exchange of knowledge within the students and the parents as well as the society (neighbourhood). Based on the idea of interpreting ‘Education – as solving a mystery’, a series of pause points guides the program chain whereby the RG becomes the revelation in this circulation. The practice of the institution should not be bound to its students, but should also be learning as well as a social hub for the local residents. In this way, the school actually becomes an indirect connection between the neighbourhood and the recreational ground. Based on the Idea, the situational analysis and the program chain derived, the design was developed in such a way that two third part of the plot will have the maximum programs in it (oriented by the introduction of an axis), while the one third fronting the main road will have the drop off zone (private entrance) and a small recreation area. The deserted warehouse was demolished and the shops were relocated in such a way that the roof (ramp) of the relocated shops becomes a secondary entrance to the school, thereby giving an access to programs like the Community Centre (a café, lecture hall and workshop hall) and the RG.